The mayor of Los Angeles won't be advocating for the addition of a second NFL team. Instead, Eric Garcetti says he would like to see the Chargers stay in San Diego. "We'd welcome any team to come here, but I love the idea of a great rivalry to the south," Garcetti said Wednesday. "We wish them luck." Garcetti, speaking as a guest on ESPN Radio's Capital Games podcast, said he also hoped theRaiderswould stay in Oakland. The NFL's owners OK'd the Rams' bid last week to relocate to Los Angeles; the Chargers or Raiders could still join them. The Chargers have one year to see if they can make it work in San Diego with the hope of securing a new facility. The Raiders would then get a shot. Garcetti said his advice to other mayors is, "Don't be so desperate for a sports franchise and don't put your city in debt for decades. "Garcetti and Rams owner Stan Kroenke met on Monday night and discussed the possibilities of new events coming to the city when the estimated $1.1 billion complex opens in 2019 on the site of the former Hollywood Park horse racing track. Officials from the Rams and Chargers also met Monday about a potential partnership in the Inglewood stadium project. This discussions, which the teams said would remain private, was believed to be more of an exploratory discussion as the Chargers continue to weigh their options. Garcetti, who said he grew up a Rams fan, added that the NFL chose the Hollywood Park site because it would give the NFL a home in the West, a new location for the NFL Network and a chance for the NFL to host major events with celebrities. The Rams played in Los Angeles from 1946-1994. The Raiders played in Los Angeles from 1982-1994. Garcetti said he expects the project to produce 4,000 to 5,000 short-term construction jobs and another 2,000 to 3,000 permanent jobs once the full development is complete. He said the increase in the Inglewood taxes from the facility will help improve the infrastructure in the area. Garcetti also said the new Inglewood stadium will be a key add to the city's bid to secure the 2024 Summer Olympics and help the city get Super Bowls and a possible Final Four. The Rams will move from St. Louis to Los Angeles in the fall of 2016 and are expected to play in the Los Angeles Coliseum until the new stadium is ready. The Hollywood Parkcomplex is expected to include a residential and retail area. 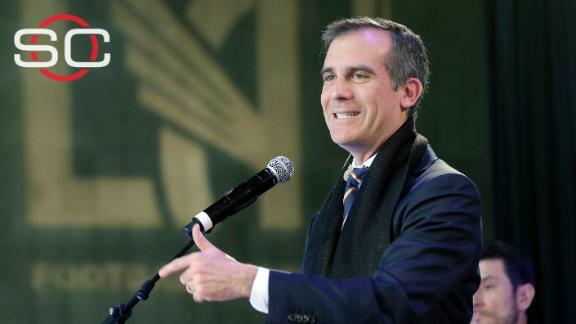 "We talked about bringing the Super Bowl here every four or five years," Garcetti said. "We're looking at the Final Four. Also, this wasn't part of our Olympic bid. Now we can add this to the bid. It's huge. It says to the world that you can do a sustainable Olympics and be cost sensitive." Los Angeles has replaced Boston as the United States' Olympic city candidate. Los Angeles is competing with Hamburg, Germany; Rome, Italy; Budapest, Hungary and Paris, France. The International Olympic Committee will choose a site by vote in Lima, Peru, in September 2017. Los Angeles last hosted the Summer Olympics in 1984. The Final Four has not played west of St. Louis or the state of Texas since the 1995 Final Four in the Kingdome in Seattle. Oklahoma athletic director Joe Castiglione, who is currently the NCAA tournament selection committee chair, told ESPN this week that the NCAA did discuss the possibility of Los Angeles as a Final Four site at its meetings this week if the stadium has a retractable roof. ABC News political director and co-host of ESPN Capital Games podcast Rick Klein discusses Los Angeles mayor Eric Garcetti's comment that he'd like the Chargers to stay in San Diego because he'd like to see "a great rivalry to the south."